A Content Management System (CMS) is software that you use to update your website yourself, as often as you like, with no HTML or programming knowledge required. WordPress is our CMS of choice. It is the most popular CMS software available today and is currently used by over 60 million webmasters world wide. WordPress is an open-source Content Management System created in 2003 and is now used by over 17% of the entire Internet! That translates to over 71 million websites! WordPress allows website owners to manage their web pages and blog posts from a user-friendly, intuitive dashboard. The changes you make in WordPress appear live on your website instantly. 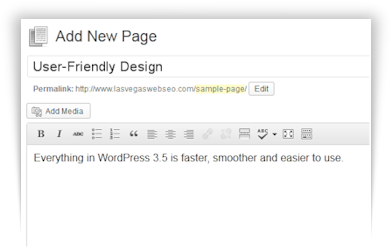 You can use WordPress to add unlimited pages, create blog posts, make changes to text, images and more in real-time. You can even upload PDF documents, create and edit photo galleries, embed YouTube videos and add other powerful website content in seconds. The dashboard is the main administration page of WordPress, from here you can navigate to any management area of the entire website. 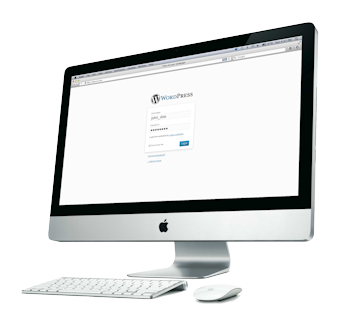 The dashboard is secured with the latest security standards and can be accessed on any computer with an Internet connection using your unique username and password. WordPress has never been quite so mobile before. 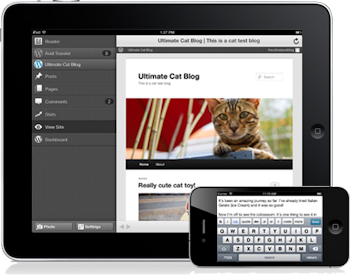 Designed for both iPhone/iPod Touch and the iPad, WordPress for iOS makes it easy to post photos, write blog posts, and edit your content while on the go. Download it from the App Store today. We design all of our websites with standards in mind. All of our websites feature XHTML/CSS3 coding and validate accordingly to w3c.org. To learn more about the importance of standards in web design, read our tutorial here. WordPress is our CMS of choice as well as over 71 million other website owners. It is powerful, constantly updated, flexible and best of, user-friendly. If you can edit a Microsoft Word document, you can use WordPress – it is literally that easy! WordPress is not just blogging software anymore. Although many of our clients use it for blogging purposes, its much more powerful today than it was years prior. Today, WordPress can manage your entire website. Everything from blog posts to photo galleries, YouTube videos to integration with CRM systems. WordPress is so powerful and robust, why would you use anything else?